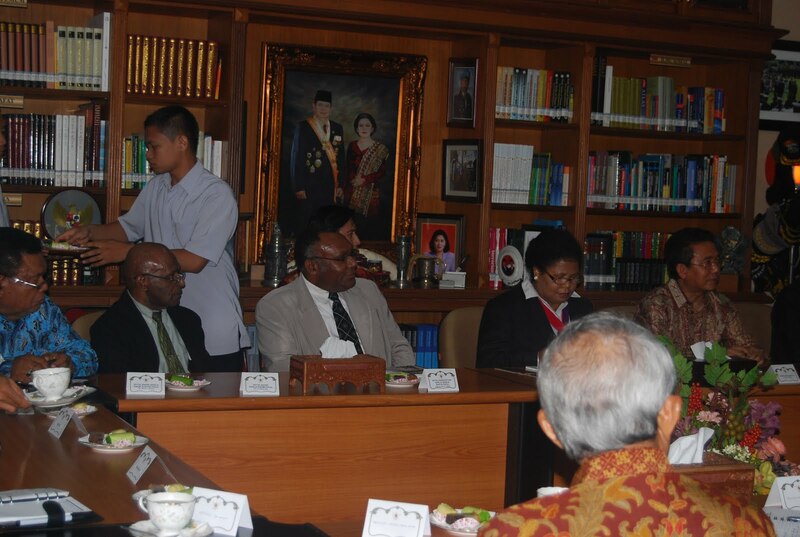 FOUR PAPUAN church leaders met Indonesian President Susilo Bambang Yudhoyono, Vice President Boediono and several cabinet members as well as Indonesia’s military commander and its police chief in President Yudhoyono’s private residence in Cikeas, outside Jakarta, on Friday Dec. 16. They included Rev. Jemima M. Krey (chairwoman of the Evangelical Christian Church in Papua or Gereja Kristen Injili di Tanah Papua), Rev. Benny Giay (chairman of the Kingmi Gospel Tabernacle Church or Gereja Kingmi di Tanah Papua), Rev. Socratez Sofyan Yoman (chairman of the Alliance of Baptist Churches in Papua or Persekutuan Gereja-Gereja Baptis Papua) and Rev. Martin Luther Wanma (chairman of the Indonesian Christian Bible Church or Gereja Kristen Alkitab Indonesia). Frederika Korain, a Papuan human rights activist and an Australian National University student, also joined the delegate. The meeting was initiated by the Communion of Churches in Indonesia (Persekutuan Gereja-gereja di Indonesia) whose board members also took part in the meeting: Rev. Andreas Yewangoe (chairman), Rev. Gomar Gultom (secretary general) and Rev. Phil Erari (deputy chairman). The church leaders handed over a seven-page letter to President Yudhoyono, asking the Indonesian government to have a dialogue with the people of Papua. They also asked Yudhoyono stopping the Matoa Operation in Paniai, Papua, which had caused 14 dead and some burned villages on Dec. 12. Other recommendations included retrieving non-organic troops from Papua, releasing Papuan political prisoners and annulling the Government Regulation No. 77/2007 which bans the Morning Star flag. Giay came from the village Onago on Lake Tigi in Paniai, near Edadu, where the Indonesian military and police have been organizing a joint military operation since Dec. 13. They also told President Yudhoyono that most native Papuans have suffered from Indonesian rule since Indonesia took over New Guinea in 1962. Violence created much suffering on the people. They said most Papuans aspired to be separated from Indonesia. In front of his guests, Yudhoyono immediately asked Indonesian police chief Gen. Timur Pradopo to stop the Matoa Operation. He also mentioned that U.S. President Barack Obama and State Secretary Hillary Clinton had raised the issues of human rights violations in Papua. Yudhoyono welcomed such a dialogue but he reminded his guests that as president he has to keep the territorial integrity of Indonesia. He promised to enforce the law in Papua and to stop human rights abuses. Yudhoyono promised to have another dialogue with the four reverends in the third week of January. The meeting began at 9pm and ended at 11.30pm at Yudhoyono’s private library. Gomar Gultom organized a press conference at the office of the Communion of Churches in Indonesia Saturday morning. Both Yoman and Giay are under the Indonesian military watch list. An Indonesian military document leaked in August 2011 revealed that Kopassus agents were closely monitoring Giay and Yoman. Another leaked letter dated April 30, 2011, from the Indonesian military commander in Papua, Maj. Gen. Erfi Triassunu, to the provincial governor, Barnabas Suebu, also shows a military interference in civil society in Papua. The letter accuses Rev. Benny Giay’s Kingmi Gospel Tabernacle Church of trying to build an exclusive organization based on Papuan ethnicity, which Major General Triassunu viewed as a potential separatist movement, and suggests having the military mediate a conflict between the Kingmi Church (Gereja Kemah Injil or Kingmi Church) and the Indonesian Gospel Tabernacle Church (Gereja Kemah Injil Indonesia or GKII). The letter also urges that if deliberations cannot resolve the conflict, “immediate action” should be taken. Since the letter came to light, Major General Triassunu has publicly apologized for accusing the church of being a separatist organization, claiming a faction of the church had asked for assistance from the military. Giay told me that Yudhoyono was surprised when seeing the photo of a dying Papuan activist Wayan Wayeni on the letter. They told him that Imam Setiawan, the Indonesian police officer who led the attack against Yawan Wayeni on Serui Island, in August 2009, was later promoted to be the police chief of Jayapura. In his new position, Setiawan used excessive forces when cracking down the Papuan Congress in October 2011 and arrested around 300 Papuans. But Setiawan got another promotion despite a written warning for his abusive behavior. He’s now the deputy director of traffic in Papua. Why doesn’t the world believe that Indonesia is evil country? They keep occupying Papua and killing the unarmed Papuan leaders who fight for justice, truth and freedom. The main reason is Papua is the land to feed Indonesia and killing the Papuans (burning down the churches) will allow them to heaven. Isn’t it enough for the world to see how this evil country keeps holding Papua whose inhabitants are mostly christians? We do the believe God will wipe out this evil state from Papua as what they have been doing in Papua since 1962 is parallel to what evil, father of all lies, do. Unfortunately, when facing Malasya or SIngapore, their forces are like chicken as these tow countries have mordern arsenals and well-trained forces. 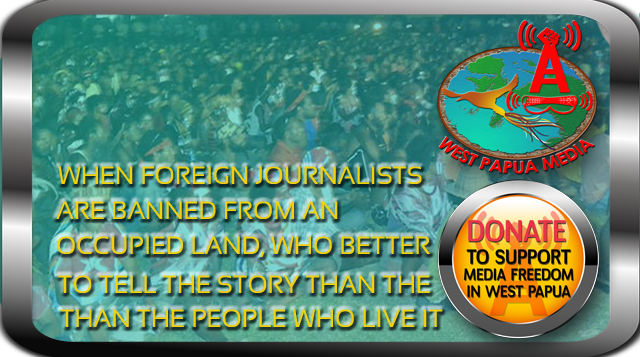 But see what they do to the un armed Papuans, they arrogantly show their foolishness. God bless Papua and the countries that will help the Papuans. Amen.